A cataract is a clouding of the natural lens of the eye. When you are born, this lens is clear and helps to bend (refract) light to focus it. 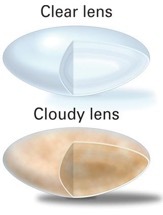 Over time, this lens can become cloudy, causing blurring of vision. Generally, this happens slowly over time but occasionally can come on more quickly. Other factors such as smoking, UV exposure, medical conditions such as diabetes, and certain medications such as steroids can accelerate the onset of cataracts. Cataracts generally tend to affect people after the age of 55-60 years, though occasionally can be seen in younger individuals. The only way to evaluate for cataracts is with a comprehensive dilated eye exam. When cataracts are mild, a small change to the glasses prescription may temporarily improve the vision. When cataracts are significant enough to affect the vision or your activities of daily living, surgery is recommended to relieve the symptoms. Cataract surgery is the most common surgical procedure done in the United States with over 3 million being done every year. What is a “secondary” or “after” cataract? Often, weeks, months or even years after successful cataract surgery, a visual decline can occur due to clouding of the bag that the new IOL sits in. While some people worry that their cataract is growing back, it is actually a hazy membrane growing just behind the IOL. The medical term for this is posterior capsule opacification (PCO). This can be quickly cleared with an in-office laser procedure called a YAG capsulotomy, which creates a clear window in that bag. This painless procedure only takes about a minute and typically does not need repeating once completed.